Christmas came early at the Pickiest Eater household! Just the other day, the doorbell rang, and much to our surprise (and delight), was two boxes of Donuts from Krispy Kreme! What was in it? Krispy Kreme's Holiday Donut series that will surely make Magic Happen! Before you go any further, please let me apologize for the quality of the pictures, which is nowhere near the level of previous entries in my blog. During my trip to the states, I left the DSLR camera back home, and relied solely on my iPad, which I've come to regret, but at the time it was the smarter move. Nonetheless, enjoy the first entry from my trip to the United States, earlier this year. Yup, Chef Gordon Ramsay followed me on Twitter. He has probably unfollowed me by now, but you can imagine how excited I was when I saw this! He followed me after I tweeted him, "If I ever go to Las Vegas, I'm going straight to Gordon Ramsay BurGR". Well, last June, I went to Las Vegas, so it was time to put up. We got a great deal for rooms in Planet Hollywood, so I had no excuse. Even though I'm fairly certain Chef Ramsay forgot about my tweet by now, I believed I had a promise to fulfill. Finally something to to check off my bucket list.. dining in a restaurant of Gordon Ramsay. HE'S BACK! TOM SAWYER'S FRIED CHICKEN IN TIENDESITAS! As a child studying in O.B. Montessori during the mid-80s, trips to Greenhills were quite frequent. We would usually stop by McDonalds for lunch, just before my 11am class. The lure of course was the happy meal and the toys that it came with. There was one instance though that I recall being extremely disappointed because we arrived a little later than usual, and the place was packed. Since we couldn't get seats, my Yaya decided that it would be best to take us somewhere else for lunch, rather than risk us being late because we were waiting for a table at McDonald's. You must remember that I was only a few years removed from living in the United States, so places nearby such as Goodah had absolutely no appeal to me. Thankfully, my Yaya (believe me.. If there's anyone who knows how Picky I am, it's her) spotted a restaurant that she knew would be to the approval of my finicky taste buds. And that was the first time I had tried Tom Sawyer's Fried Chicken. Events in my life unfolded, leading me to move to Cebu, where I lived until I graduated High School. As I returned back to Manila years later, the name "Tom Sawyers" was only spoken of in sentences that usually began with the words, "Whatever happened to...?". Guess what folks? He's Back! You read that right.. Tom Sawyer's Old Fashioned Krispy Fried Chicken is back in the metro! I've been back to Village Tavern quite a few times since that very first Epic Meal I enjoyed there when it first opened a couple of years ago. Since that first meal, Chef Josh Boutwood has continued to innovate his menu, consistently coming up with new dishes that keeps his customers coming back for more. Chef Josh's newest menu concepts were inspired by the Southwestern fare, and he managed to give it his trademark spin that makes Village Tavern's dishes so memorable! It's been ongoing for 7 years, and this year, it's back! In stylish and classy patterns which will make you want to collect all! Thank you McDonald's for our complete set!!! 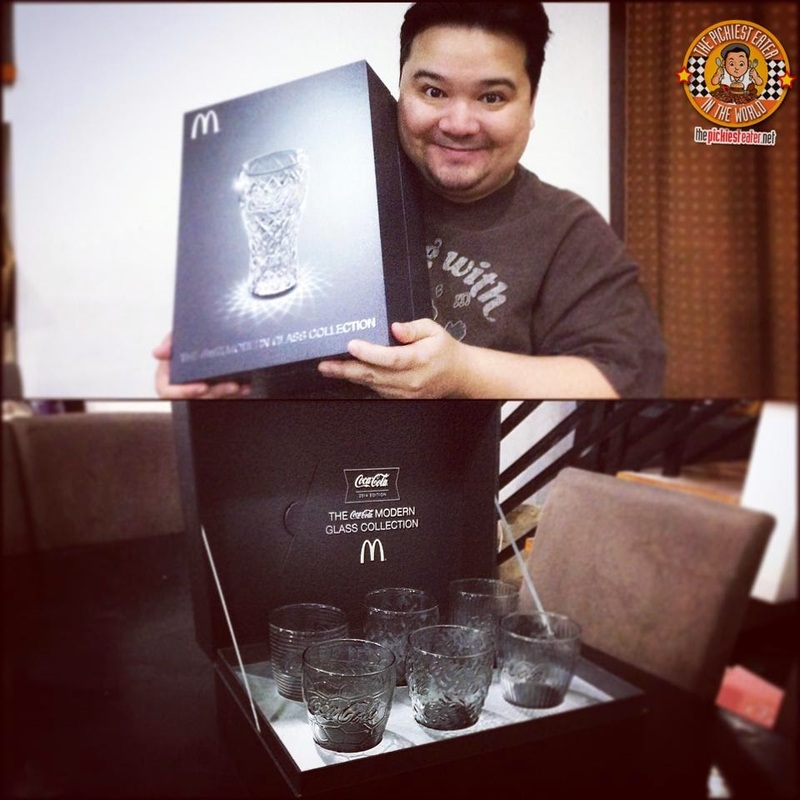 It's the 2014 Coca-Cola Modern Glass Collection! Longganisa has been a sausage dish that has been popular in a lot of Spanish countries and the Philippines. And it’s hard not to like it. Especially to meat lovers like Richie. Compared to processed sausages, longganisas have chunkier and tastier meat. This often means the fat are chunkier too. Just the way Richie likes it hehehe. I grew up liking Longganisang Ilocos because my family’s province is in Bangued, Abra. I am only able to try it whenever we visit our grandmother in the province, when we are able to schedule a vacation. Which is a shame because it’s really good. Very savory, this one’s not sweet at all but really tastes good especially with vinegar! But anyway, because longganisa is so popular in the Philippines that there are a lot of other different variants of longganisa in the Philippines that I haven’t tasted yet. Until today! 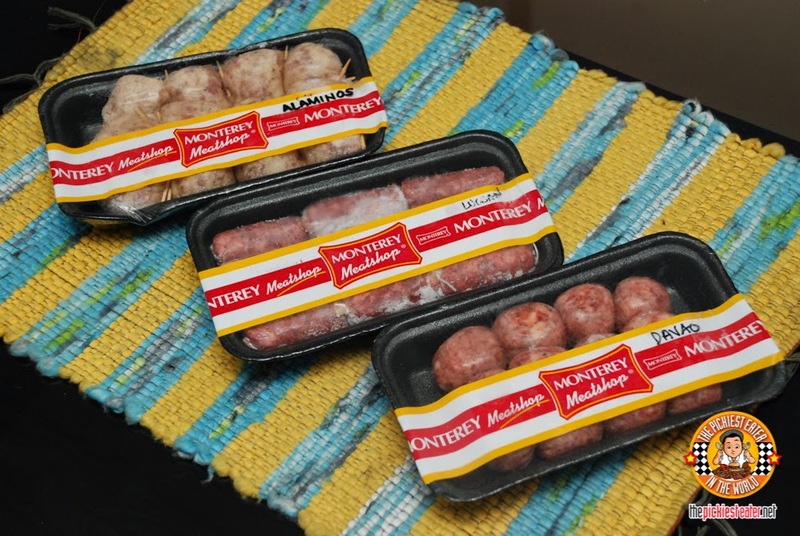 Thanks to Monterey Meatshop, some of these regional homemade and authentic longganisas can now be bought here in Manila at affordable prices! Monterey Meatshop now produces authentic longganisas including Longganisang Alaminos, Longganisang Lucban, and Longganisang Davao. Chocolates, Cheese, Watches, Army Knives and Banks. Those are the very first things that come to my mind when I think about anything "Swiss". Sadly, I am left at a loss when I try to think of any sort of food (aside from Chocolate and Cheese of course) that comes from the great country of Switzerland. Thankfully, Swiss Week is happening at Edsa Shangri-la Hotel this week, so I got a little teaser of what to expect! I still remember the morning after I arrived at the United States. I had a whole slew of restaurants that I intended to invade, and I couldn't wait to make my way through that list. A lot of those places were restaurants I found in Man V. Food and other food shows I'm obsessed with but, but for some reason, the first thing I wanted to try was a McGriddle from McDonald's. Thankfully there was a McDonald's 5 minutes away from my Uncle's place where we were staying at Laguna Niguel, in Southern California, so my brother and I made the quick drive, first thing the following morning of our arrival. What makes the McGriddle rather unique is the way the "Griddle Cakes"- which serve as the sandwich buns-, have the maple syrup baked into it, giving the cake a tinge of sweetness that goes well with whatever savory filling you choose. I really enjoyed the McGriddle, and I must have gone back for one at least four or five other times during my 5 weeks in the United States. My mentality was to enjoy it as much as I can, because I highly doubted that the McGriddle would ever be available in the Philippines anytime soon. 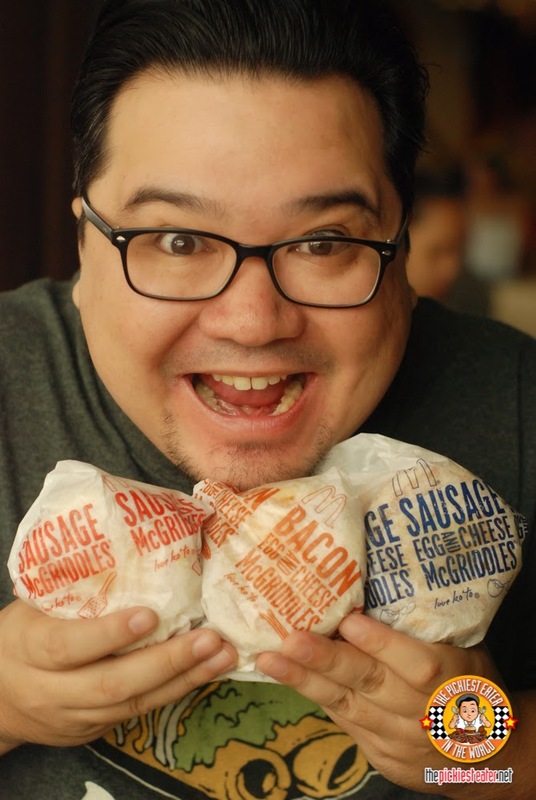 I'm proud to announce that the McGriddle is now available for breakfast at selected outlets here in the Philippines! I'm still coming to terms with the fact that we only have a little over a month until Christmas! 2014 has been one of the best years of my life, and my wife and daughter played a huge part in making that happen. That's why we intend to make the most of the holiday season as a family, giving thanks to God for the many blessings he has bestowed upon us. Since shes three years old already, we wanted to make sure that Rain understood the facets that make Christmas such a wonderful time, especially for Children. Last year, she still didn't have an understanding of who Santa Claus was. For all she knew, he was just a fat guy in a red suit. This year, our first step to getting Rain into the Holiday Spirit was to take her to Marriott Hotel's Tree Lighting Ceremony! On the rare occasions that I find myself at the South, I can't help but be on the look out for some great places to eat. During my short weekend food trip down south a couple of weeks back, My buddy Richard of Tales From the Tummy, invited me to try yet another Ramen place that has sprouted, this time located at Westgate, Alabang. Being the certified carnivore that I am, I was actually hoping for more of a meat based restaurant, instead of a bowl of hot noodle soup. I told Richard about my apprehensions. "I'm not sure I'm in the mood for Ramen. I'm looking for pork-", I said. 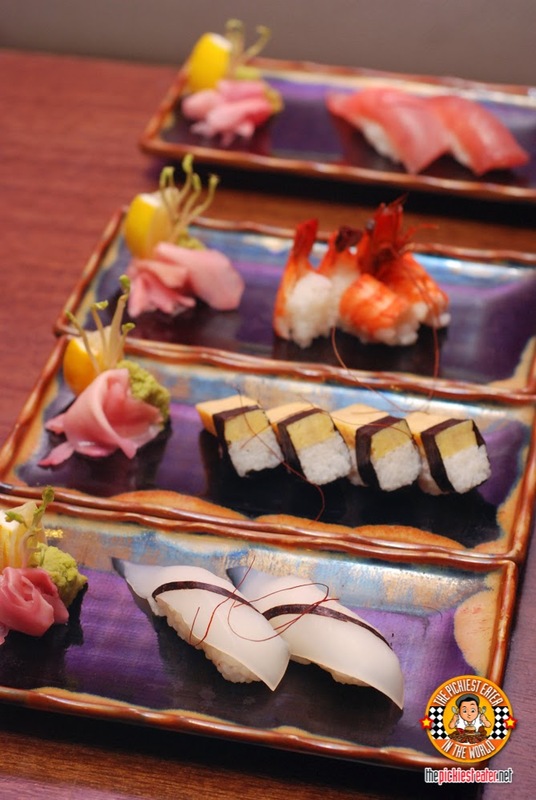 "The name of the restaurant is 'Butamaru'", Richard interrupted. "'Buta' is Japanese for "Pig". The dishes are Pork based. ", he replied. "So, what time do we meet?" Richie is a sucker for massages. Every time we come home from wherever, somehow he always says "I think I'll get a massage". We may have tried all the home-service massage service near our area. He often complains that he can't find a masseuse that can get the right pressure that he looks for in a massage. 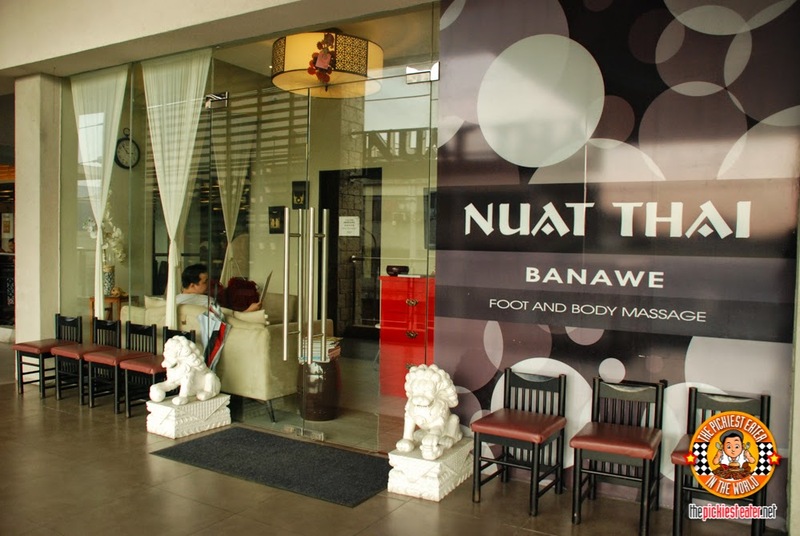 Just recently, a trip to Nuat Thai in Banawe changed all that. I'd like to share with you our very first Nuat Thai experience! Much to the protest of my sister, I rarely ever visit the South. I have heard of some of the wonderful places to eat at there, but with the exception of Mama Lou's, I had yet to schedule our long-planned-but-can-never-seem-to-push-through Food Crawl of some of the best restaurants in BF Homes. A few weeks ago, Rina and I decided to use a voucher for Bellevue Hotel Alabang that we purchased earlier in the year. Baby Rain had a Halloween party to attend at Bellevue as well, so the timing was perfect. My buddy Tales From the Tummy also had a GC for a stay at Crimson Hotel, so we decided to make it a Food Trip Weekend down at the South! As soon as our bookings were confirmed, we contacted the Queen of the South, Sugar & Spice herself, Jane Go, to let her know that we would be entering her kingdom. The next thing I know, (Before Richard and I could even plan anything) Jane had reservations for us at one of her favorite restaurants in BF. In fact, it was the restaurant that I had been most eager to try.. Bamba! I don't know if you know this, but I used to work in a Post Production House in Makati. I started at around 2007 or so, and our biggest clientele came from advertising. Whenever there was some sort of event or function.. Or if you wanted to take a client out, one of the go-to places to do so was Il Ponticello. Truthfully, I know the place is an institution, but I don't have any fond memories there.. Well. Let me correct that - I have no memories of the place whatsoever. I know they served Italian cuisine classics, but I never tried any of the dishes, because I thought it was more of a bar than a restaurant.. and I don't drink, so all my visits were always very brief. Cut to 2014. Il Ponticello is back, and it's better than ever. With a jazzed up Modern Italian Menu that will definitely captivate your taste buds, It was time for me to make up for lost time and discover what made Il Ponticello the iconic hot spot that it is. You know, I went to Korea early this year, and I had a wonderful time. It's truly a beautiful country that I would love to visit again in a heartbeat. But perhaps it was the places that we had gone to, but food-wise, none of the restaurants we went to really blew me away. In fact, you may have noticed, I haven't seen anything about it on my blog yet, and I'm actually thinking I might not bother writing it at all. Not because I didn't enjoy the food there.. But because I think restaurant owners have done a great job of raising the standards of quality of the Korean food in their establishments here in the Philippines. One such restaurant is one that you may not have heard of just yet, but believe me, once you try their excellent Korean food, you will inevitably be back over and over again. I'm speaking from experience because I've been back twice since. Remember the name, folks.. Yoree Korean BBQ Dining.